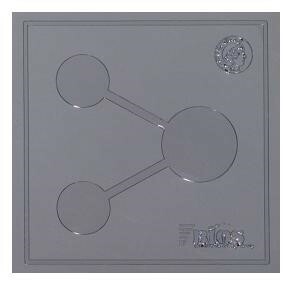 In this project, an integrated microfluidic platform is developed for Assisted Reproduction Technologies (ART). Such a platform where embryos are cultured during their pre-implantation development and characterized in real-time can find two main applications for embryo studies. By providing feedback in real-time on the embryo development, such a system is of great interest for optimization of the ART protocol. Secondly, such a tool can be applied in clinical settings (IVF clinics and centers) for embryo culture and characterization in the frame of an ART procedure. Microfluidic device developed for the pre-implantation culture of embryos. The device includes a culture microchamber (500-2000 μm diam. or 30 to 480 nL volume), and embryos are introduced therein with the help of reservoirs and microfluidic channels. The device is made in PDMS (polymer material) and bonded to a glass substrate. Microfluidic devices are applied for the pre-implantation culture of mouse embryos embryos in groups of 5 embryos or as single embryos in 30 or 270-nL microchamber. 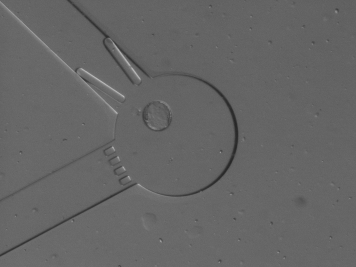 Mouse single embryo culture in a 30-nL microfluidic chamber. The embryo reaches the blastocyst stage (last step of its pre-implantation development) after 3.5 day of culture in the microdevice. Using such a small microchamber, embryos are seen to develop faster and with a higher developmental rate. The possibility also to culture individual embryos in a confined environment opens the route for single embryo characterization on-line with their in vitro culture.